This board book for very young readers is narrated in a simple and happy way. 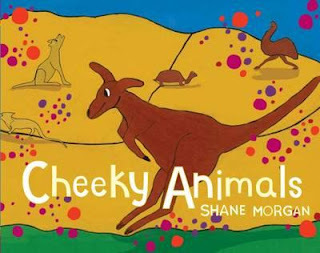 The protagonist is a traditional, indigenous Australian who finds himself in funny and playful scenarios with a variety of Australian animals. The text uses rhyme and repetition to engage readers, with couplets that begin with ‘Look at the....’ which introduces the reader to each animal and ‘See the....’ which shows the protagonist engaged in a funny way with that animal. The illustrations bleed from edge to edge and on each double spread there is a scene which is boarded. I would have preferred it to be more consistent with the left side that introduces each animal, but this does not take away from the story. Shane Morgan uses a simple, desert colour palate with simple but expressive drawings. The animal smiles when they trick the protagonist are cheeky while at the same time endearing. The illustrations have a cartoonish feel about them and could be seen as a child’s very first and basic introduction to comic books and graphic novels. I love the size of Magabala board books because they are perfect for little hands and laps and they are also light weight and durable enough for multiple re-reads. This board book will bring smiles to those who read it and I’m sure will lead to discussions about what other animals would do. This is a great book for extended adaptations.